10 photo-weavings and an installation piece by Dinh Q. Lê. Dinh Q. Lê was born in Vietnam in 1968 and emigrated with his family to the United States at the age of ten. Not yet fluent in English, he spent time alone in his junior high school library looking through art books, introducing himself to Western art history. "This is when I became really fascinated with Renaissance painting," Lê says. In college, Lê began studying photography. He experimented with different ways of combining images, exploring his place in Western culture. As a child in Vietnam he had watched his aunt weave traditional grass mats. 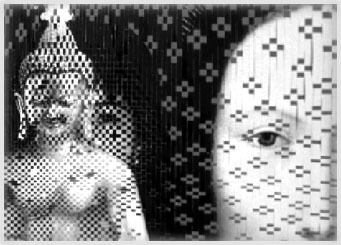 He began using her methods to interweave cut strips of photographs of himself and images from Western art history, creating photo-weavings resembling mosaics. Visiting Vietnam, he regained an interest in Eastern iconography which then found its way into his work. "By interweaving self-portraits and historical and mythological images from both cultures, I dissect existing histories to create new mythologies." The Boston Phoenix called Lê's work "a jarring mixture of antique and contemporary, sacred and profane." The exhibition, first shown at the Los Angeles Center for Photographic Studies, traveled to Cambridge, Massachusetts and Portland, Oregon before its final stop at the Sesnon Gallery. The Headless Buddha is made possible in part by the Lef Foundation.